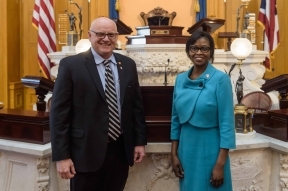 COLUMBUS-The Senate passed Senate Bill 77 this week, sponsored by Senators Frank Hoagland (R-Mingo Junction) and Sandra Williams (D-Cleveland), which will designate June 12 as "Women Veterans' Day." 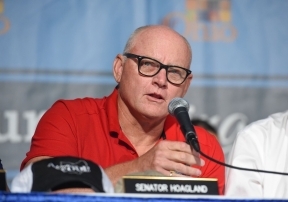 COLUMBUS-State Senator Frank Hoagland (R-Mingo Junction) this week announced the Senate's unanimous passage of legislation aimed at bolstering job growth and economic development in economically disadvantaged areas, or federally-designated "opportunity zones," in Ohio. 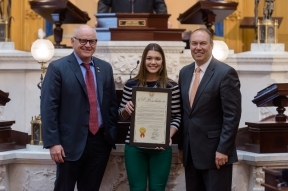 COLUMBUS-State Senator Frank Hoagland (R-Mingo Junction) today announced that the Ohio Legislative Service Commission is accepting applications through April 1, 2019 for the 2020 Legislative and Telecommunications Fellowship Program. The Commission will hire 24 fellows to serve in the Ohio General Assembly for the 2020 calendar year. 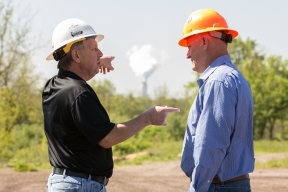 COLUMBUS-State Senator Frank Hoagland (R-Mingo Junction) recently re-introduced legislation which will help protect critical infrastructure in Ohio by enhancing penalties associated with certain types of wrongful acts that disrupt vital operations. COLUMBUS-Ohio Senate President Larry Obhof (R-Medina) this week appointed State Senator Frank Hoagland (R-Mingo Junction) as Chair of the Senate Standing Committee on Agriculture and Natural Resources. COLUMBUS-State Senator Frank Hoagland (R-Mingo Junction) today applauded the Ohio Bureau of Workers' Compensation (BWC) proposal this week of a 20 percent reduction in the average premium rate it charges private employers, its largest rate cut in nearly 60 years if approved by the agency's board of directors.